I told you that my favorite sugar cookie recipe of all time was coming up, and now I'm finally delivering. 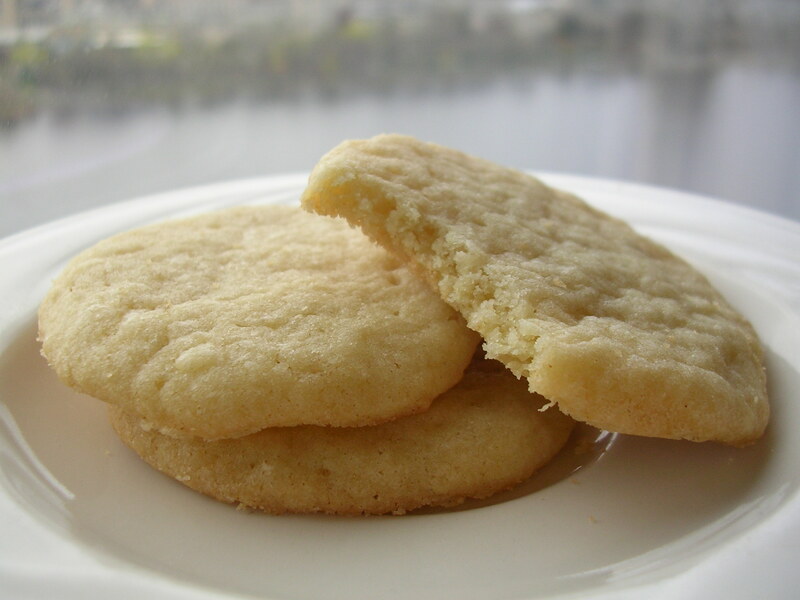 This chewy sugar cookie recipe is one that I hold absolutely dear to my heart. It was one of the first cookies that I made successfully when I was in middle/high school, and everyone that tried it loved it. Just loved it. I made dozens and dozens of them for my family and friends, and they were always gobbled up with delight. To this day, my ex still asks me to make him these cookies heh. Of course, I'm not going to pretend that I invented some amazing recipe because I was a child baking prodigy. But it is different from the most popular sugar cookies that you'll find when you google "chewy sugar cookies". Admittedly, it is based on the recipe found here, one of the first entries on google. What I did, however, was to adapt the recipe to suit my family's Asian tongue. As some you might know, Asians usually don't have much of a sweet tooth, especially when it comes to things like cookies and cakes. When I wanted to bake something at home, I wanted to make sure that my parents were going to eat it – that's part of the joy of baking! For one thing, they didn't like chocolate chip cookies much, because it was too sweet for them. So when I came around to making sugar cookies, the first thing I was quick to reduce was the sugar. Out of guilt, I also reduced the butter in the recipe (it's a little shocking how much the recipe calls for…). But I keep all the other ingredients at the same proportions, and add some almond extract for aroma. I love combining vanilla and almond extracts in my baking – it gives everything that little something extra. It's funny, because I didn't really understand the science of baking when I was younger, so I didn't really think about how altering the proportions of sugar and butter can really change the texture of the cookie. As a matter of fact, a few times I went back to the recipe to make cookies for some friends, and figured I'd go for the full sugar and butter content, only to end up with surprisingly disappointing cookies that didn't have that incredible chew I always liked. For the longest time I couldn't understand why, but now I finally do. It's a real relief. These cookies have a really satisfying chew that doesn't go away after a day. In fact, they stay just the way they are for nearly a week, if you can keep them around that long hehe. I like to make the whole batch of dough and just bake half of it for about 3 dozen cookies, then freeze the rest for quick and easy cookies when I want them. These are not the cookie cutter sugar cookies that you'd want for decorating, they're best for just eating :) So now I'm sharing my absolute favorite sugar cookie recipe with you, I hope you'll like it! 1. Sift together flour, baking powder, and salt in a bowl. 2. In another bowl, cream softened butter with sugar until fluffy. Add one egg at a time and stir until incorporated. Stir in vanilla and almond extracts. 3. Gradually add the flour mixture into the batter, stirring until well-mixed. Don't be afraid to stir it a lot. (Stirring the dough well will develop the gluten in the flour, which is important for chewy cookies!) When everything is incorporated, the dough will be heavy and slightly sticky. Cover it up and put it in the fridge for 30 minutes to chill. 4. Preheat oven to 350 degrees F. When the dough is done chilling, scoop out balls of dough about the diameter of a quarter, and place them on foil-lined baking sheets about 2 inches apart from one another. 5. Grease the bottom of a flat glass and gently flatten the dough balls until they are small discs about 1/3 inch thick. This will help your cookies spread evenly instead of mounding in the middle. This entry was posted on Thursday, May 8th, 2008 at 5:18 am	and posted in American, baking, desserts, essential baking repertoire, recipes, Uncategorized. You can follow any responses to this entry through the RSS 2.0 feed. Mmmm…. I love sugar cookies. Especially chewy ones. I'm definitely going to have to try this recipe out sometime! this is a super old recipe post, but i’m wondering if you think it would be okay to use cookie cutters with this recipe? i’m thinking they might not keep their form. I agree that they won’t keep their form if you use cookie cutters, so if you want particular shapes I would say this is not a good recipe for that. Hi Sherry, I’m not sure what happened to your batch, but I assure you the recipe itself has not changed! Every time I make these cookies I come to this post also and they’ve turned out right. I typically use unsalted butter and also use the 1/2 tsp of salt (if you look at the original recipe that I adapted this one from, you’ll see they also use 1/2 tsp salt). I’m sorry that these didn’t come out as you expected this time, but it sounds like maybe it was a fluke, so I’d give it another shot and see if it comes out like it used to. 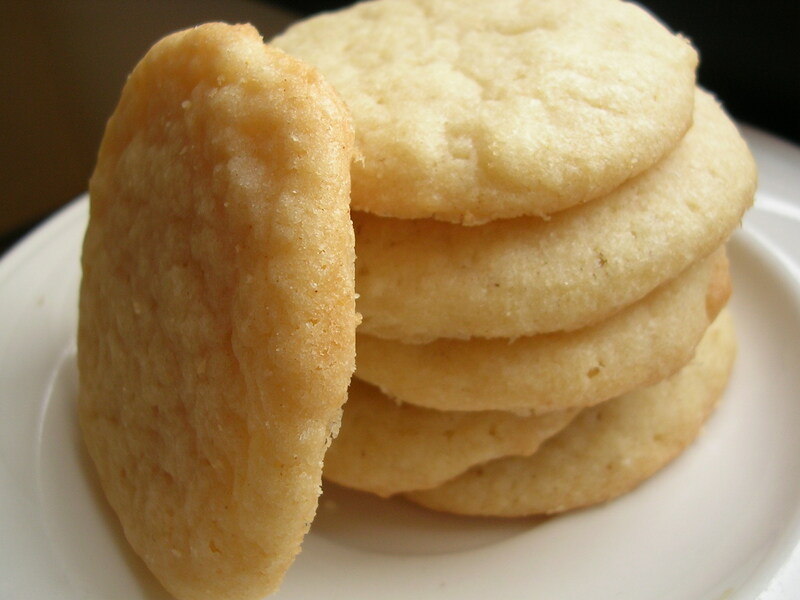 Seems simple and am too hoping this is the sugar cookie recipe I have been looking for. Looking forward to making them this evening. Thanks for sharing! Hi Samantha, I would not substitute margarine for butter in any baking recipe – I have done this in the past with other cookies and it tends to come out with a strange consistency and spreads out flat.